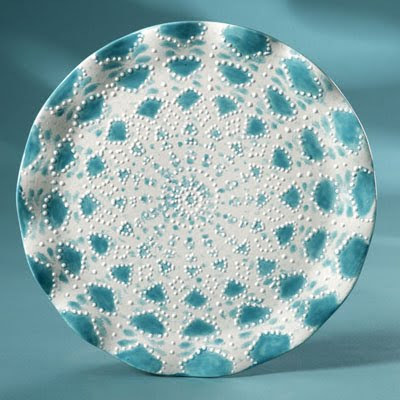 Give classic lace a modern twist on the Duncan® Oh Four™ Wavy Ware Dinner Plate! Pair a doily with Concepts® Underglazes and French Dimensions™ to add a trace of lace to your table or home décor. 25820 Wavy Ware Dinner Plate 10" x 10" x .75"
Wipe plate with dampened sponge to remove bisque dust. Brush three coats of Bright Caribbean onto back of plate, letting dry between coats. Rinse out brush. Brush two coats of White onto top of plate, letting dry between coats. While plate is still wet, carefully lay crochet doily on top and gently press down into the paint. Make sure all areas of the doily are adhered to plate. Let dry. Lightly sponge Bright Caribbean over the doily, making sure to dab paint in all open areas. Let dry then repeat twice more, letting dry between coats. Let dry then remove doily. Use Pure White French Dimensions™ to create dots around the doily design for added dimension and to create the feel of crochet. Let dry. Tip: Test Pure White on paper towel before applying to plate. If paint is too thick, add a few drops of Thin ‘n Shade and mix with a craft stick. Stilt plate and fire to witness cone 06.